The IARU Amateur Satellite Frequency Coordination Panel has announced frequencies for the Shin’en2 linear transponder. 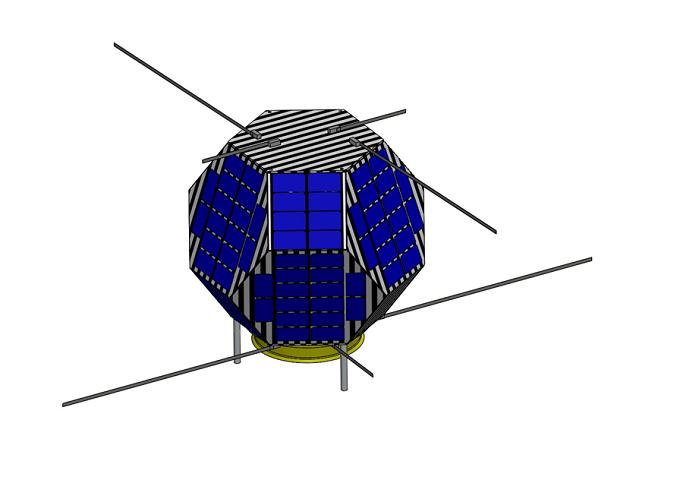 Shin’en2 is a 17 kg satellite measuring 490×490×475 mm built by students at Kagoshima University in Japan which will carry a 145 to 435 MHz linear transponder into a deep space orbit. • To establish communication technologies with a long range as far as moon. The orbit will be quite different from the previous satellites. Shin-En2 will have an elliptic orbit around the Sun and travel to a deep space orbit between Venus and Mars. Its inclination will be almost zero, which means Shin-En2 will stay in the Earth’s equatorial plane. The distance from the Sun will be between 0.7 and 1.3 AU. An Astronomical Unit (AU) is 149,597,871 km. Shin’en2 is expected to launch in the 4th quarter of 2014 with another amateur radio satellite ARTSAT2:DESPATCH on a H-IIA rocket with the asteroid explorer Hayabusa 2 as the main payload.